We wish to express my condolence over the victims of the Tohoku Earthquake on March 11th 2011, and we are sorry for suffering people in disaster areas. Fortunately, we suffered very few damage in Hirosaki. 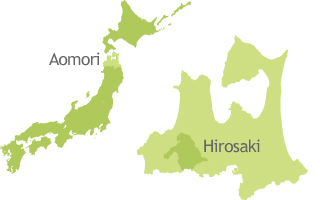 And also Hirosaki is far away from Fukushima, so that there is no effect with amount of radiation in the air. Radioactive material is not detected from any crops, water or rain. The daily lives of Hirosaki residents, tourist facilities or accommodations are the same as they were before this earthquake. 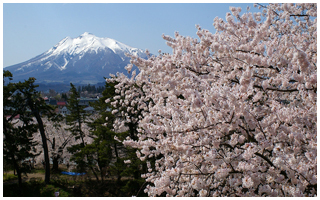 For this reason, you can visit and stay in Hirosaki in relief. We are pulling together for not only Tohoku district but also hall Japan to recuperate normally. We are sure that you’ll find many good charms of Hirosaki and you’ll love Hirosaki. We‘ll be waiting for you to come Hirosaki from the bottom of our heart. Hirosaki is a castle town which located in Aomori Prefecture, Tohoku region in Japan. There are traditional streets such as castles and samurai residences and western-style architecture built in Meiji Era. They coexist in Hirosaki and you’ll feel the beat of history. 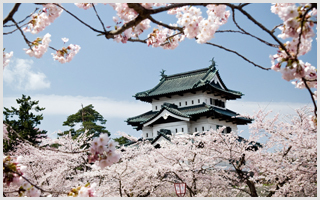 Hirosaki has cherry blossoms festival in Hirosaki park which is the greatest cherry blossoms festival in Japan. 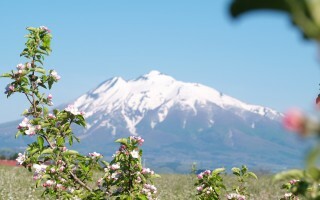 Hirosaki is also well known as best apple-producing district in Japan. Aomori prefecture is a fertile soil with abundant natures. For the reason that there is world heritage Shirakami-Sanchi, a lot of ski resorts and the area are surrounded by seas on three sides.